Musée International d’Horlogerie, by Schwizgebel. Image licensed under Creative Commons Attribution-Share Alike 3.0 Unported license. 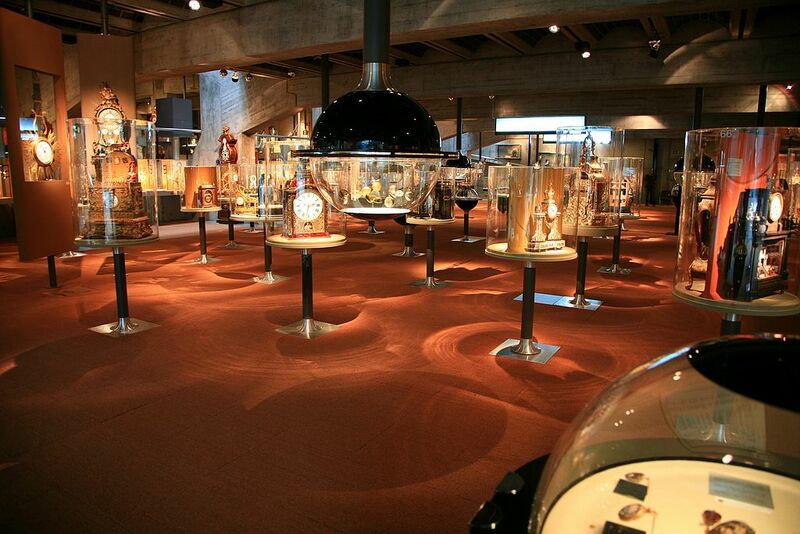 The International Museum of Horology (Musée International d’Horlogerie) is situated in the picturesque Swiss Jura Mountain city of La Chaux-de-Fonds, in the canton of Neuchâtel. 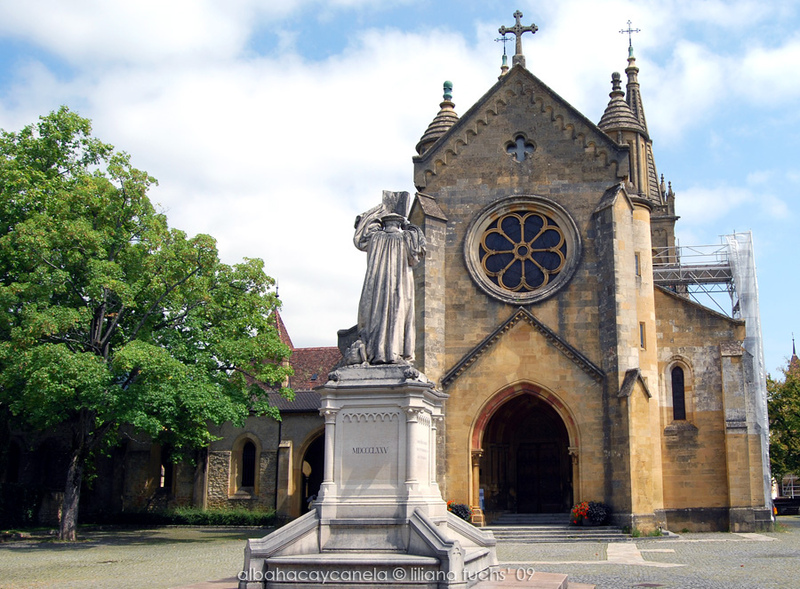 The area is famously known as the ‘Watch Valley’ which stretches approximately 120 miles from Geneva to Basel in the north-western region of Switzerland. Starting life as a small collection of time-pieces in the city’s Horological School (École d’horlogerie) in 1865, the intricate workings of a selection of watches and clocks were carefully studied and analysed by apprentice watch-makers and their teachers only. The ever-expanding collection, however, soon required a larger purpose-built space. Any endeavour to maintain restricted access to the collection proved ephemeral as it was deemed of worldwide horological interest. International prominence ensued five years later, when the collection completed its transition from meagre School status to monumental Musée international d’horlogerie, enhancing the collection’s original pedagogic purpose; this time, accessible to a wider (public) audience. 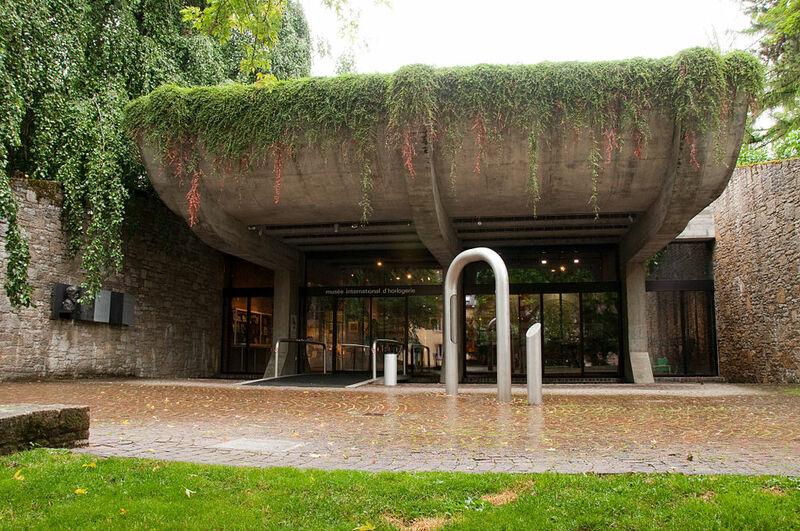 Relocating to Rue des Musées, in 1972, gave a new-found significance to the collection; strengthening its synergy with the nearby Natural History and Fine Arts Museums and boosting its historical prominence. Musée International d’Horlogerie entrance, by Tomleighmartin. Image licensed under Creative Commons CC0 1.0 Universal Public Domain Dedication. The building’’s eye-catching avant-garde architecture – largely underground – proves a remarkable arena for creative museography. Visitors are drawn in by the enticing entrance, eager to explore this intriguing cave-like space. Adding to the novel architectural design, a portico sculpture commissioned for the museum’s 25th anniversary (1999) – known as the ‘Porte magique’ (‘Magic Door’) – welcomes visitors to the museum broadcasting the time in French, German, and English. Scientific work conducted here – bolstered by the creation of the ‘Man and Time’ Institute (Institut l’homme et le temps) in 1989 – offers an insight into ‘the role of time and timekeeping instruments in society’. The Institute runs a publishing house, by the same name, to communicate its research findings. Integrated within this establishment is the Centre for the Restoration of Antique Horological Pieces (Centre de restauration en horlogerie ancienne) and the Centre for Interdisciplinary Studies (Centre d’études interdisciplinaires du temps). The former carries out conservation work under the watchful gaze of museum visitors, whilst the latter houses the most comprehensive specialised horological library in Switzerland. 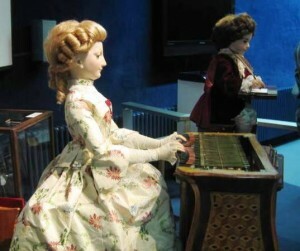 A vast majority of didactic models and kinetic sculptures are exhibited to demonstrate the development of horological techniques over time. Displays chronologically arranged from 4000BC to the present-day allow people to walk through the history of time; learn how it was studied, measured and made. 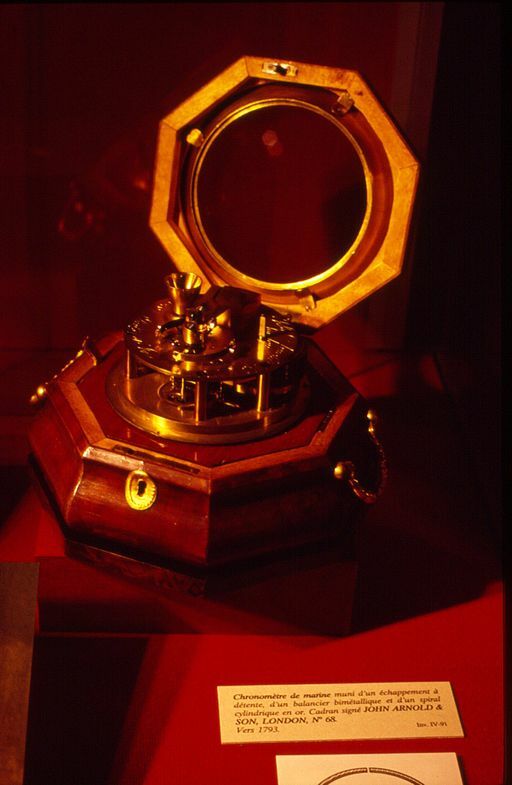 A Marine Chronometer, designed by John Arnold & Son, London (1793), by Rama. Image licensed under Creative Commons Attribution-Share Alike 2.0 France license. Once inside, visitors begin their journey by traversing the passerelle (footbridge). Their attention is drawn up to the monumental collection of local clocks – the first types of mechanical clocks invented – hanging above. Sundials and water clocks from Antiquity, a full-scale model of Giovanni de Dondi’s Astrarium (a planetarium from the Middle Ages), musical clocks and marine chronometers of the eighteenth and nineteenth-centuries, and the wristwatch and atomic clocks of the twentieth century await curious museum-goers. It is, however, the smallest and most remarkable hand-made works which captivate the imagination, artistically stationed within spherical bubbles ingeniously suspended from the ceiling. Reconstructions of watchmaker, engraver, and enameller workbenches are displayed equipped with all the (original) tools of their trade – from pin punchers and precision screwdrivers to lathe machines and their components – bringing the watch-maker to life. Any occupying thoughts of how such intricate items were made, where, and by whom, are instantly answered. Evolutionary mechanisms and decorative clock case designs, symbols of the technological advancements made in the late nineteenth- and twentieth-century watchmaker’s workshop, all highlight the talented and artistic flare requisite in the watch-making trade; formulating a vista of historical craftsmanship. The museum’s unique ‘Vivre l’heure’ exhibit – a giant clock-face embossed on the floor with spotlights above – allows visitors to interact with time itself. Standing in the centre, their shadow becomes the hands of a clock, projecting an accurate image of the time onto the floor below. 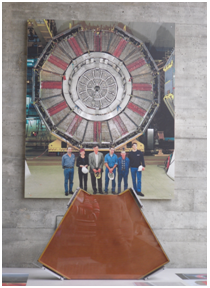 A segment of the TPC from the ALEPH particle detector (following the Large Electron Positron Collider’s (LEP) dismantling in 2000). Upstairs, the ‘belfry’ houses a temporary exhibition dedicated to CERN – ‘Echo of the Sky’ (L’Echo du ciel) -which showcases a segment of the time projection chamber (TPC) from the ALEPH particle detector, given to the museum in 2001. 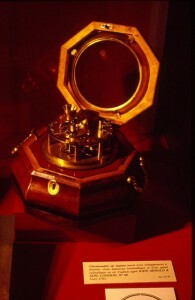 This gallery also displays high precision timekeeping devices used particularly in observatories. It houses a magnificent meridian telescope from the early twentieth-century, as well as the latest in Global Positioning System (GPS) technology. The exterior carillon completes the unique architectural design of the museum. Standing in the grounds, this iconic twentieth-century structure, with fascinating aesthetic qualities, represents a futuristic time-piece that is both a kinetic clock and musical instrument. Its twenty-four tubular bells liven up every fifteen minutes with a tune, which changes depending upon the season, accompanied by seasonal colour-changing shutters, which move in time to the music. The museum personifies the continuously evolving measurement of time. 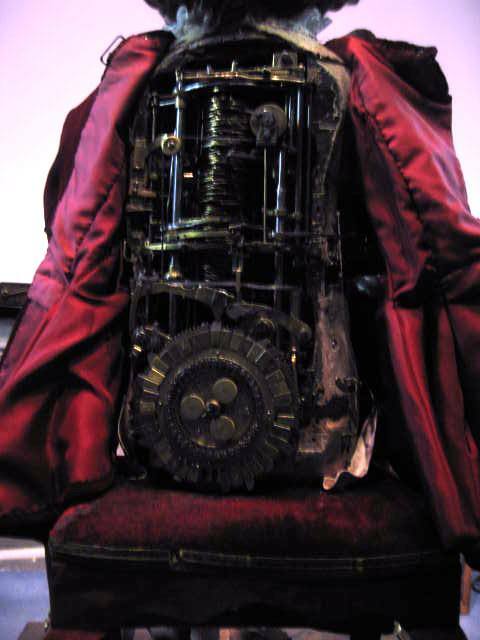 It depicts fascinating stories of how our ancestors kept the time, as well as how advancing technological innovations will continue to time-keep for generations to come. Showcasing delicately intricate as well as larger complex time-pieces from around the world, the museum displays the numerous values time-pieces have embodied; be they ornate symbols of wealth or daily (fashion) accessories. More significantly, the exhibitions present the ways time-measuring technology has influenced and developed other technologies – GPS, for instance, – for occupational as well as personal uses. This collection confidently justifies its title of ‘horological capital of the world’. Neuchâtel by Akane86. Image licensed under Creative Commons Attribution-NoDerivs 2.0 Generic license. Louis Agassiz, the leading figure in persuading geologists that a recent Ice Age had engulfed Europe, was one of the first professors to be appointed to the University of Neuchatel in 1840. He is honoured by a bust and plaque in the principal administrative building at the corner of Avenue du Premier Mars and Rue P. L Culon, but, sadly, the local natural history museum at the present time has no exhibits related to Agassiz or even to geology in general. For dedicated mountaineers there is an Agassizjoch at 12,700 feet (3850m) on the approach route to the summit of the Finsteraarhorn in the Berner Oberland. We don’t know if there is a direct connection with Louis Agassiz.